Do Almonds Cause Weight Gain? Filling, delicious and ultra-convenient, almonds are a great snack option when you're trying to manage your weight. Almonds have some nutritional properties that make them helpful when you're trying to lose, and eating almonds has been linked to better weight loss in a few studies. However, you could also use them to gain weight, if you want. Whether you gain or lose depends on your entire lifestyle, including your diet and exercise program -- not just whether you eat almonds or not. Whether you maintain, lose or gain weight depends how many calories you take in daily. Eat roughly as many calories as you burn and you'll stay the same weight. Eat more and you'll gain; eat less and you'll lose. Almonds are a moderately high source of calories, at 162 per ounce, and they can work in a weight-loss or weight-gain diet. For example, an ounce of almonds would take up 12 percent of the calorie "budget" in a fairly restrictive 1,400-calorie diet, but they still wouldn't make you gain weight as long as you stick to your daily calorie goal. If you eat an ounce of almonds on top of what you need to maintain your weight, however, you'll start to pack on pounds. The extra 162 calories daily would make you gain about one-third of a pound each week, or 17 pounds over the course of a year. While you'll still need to maintain a calorie deficit and eat fewer calories than you burn to lose weight, there's some evidence that almonds might help. Eating almonds in place of complex carbohydrates might help you shed pounds, according to a study published in the International Journal of Obesity and Related Metabolic Disorders in 2003. 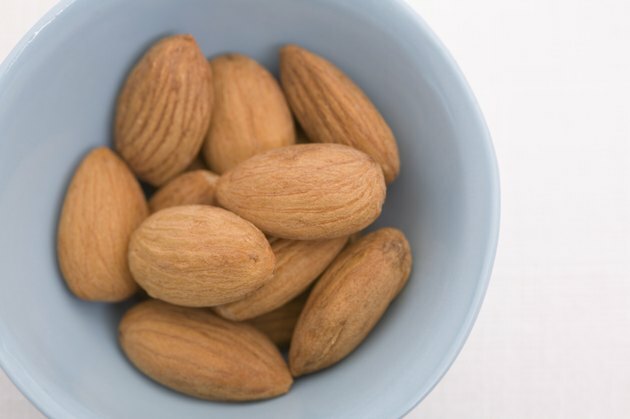 The study authors separated 65 overweight and obese adults into two categories -- one group ate about 3 ounces of almonds daily, while the other group ate a high-complex-carbohydrate snack with the same calories and protein as the almonds. Even though both groups followed equivalent low-calorie diets, the almond group lost more weight over the 24-week study period. Another study, published in the January 2015 issue of the Journal of the American Heart Association, reported that eating almonds enhanced abdominal fat loss in study subjects who ate 1.5 ounces of the nuts each day. If you like snacking on nuts, almonds might be your best choice for weight loss. Even though almonds are relatively high in calories, they're still a lower-calorie option compared to other nuts. Macadamia nuts, for example, contain 201 calories per ounce, and pecans and walnuts contain 193 and 183 calories, respectively. Almonds are also higher in protein and fiber than certain other nuts. These two nutrients support weight loss by enhancing feelings of fullness, which can help you stick to your calorie target for the day. Almonds supply 4 grams of fiber and 6 grams of protein per ounce. Macadamia nuts, pecans and walnuts all supply less than 3 grams of fiber per ounce, and all contain less than 5 grams of protein -- with macadamias offering a paltry 2 grams of protein per serving. Because almonds are still relatively high in calories, you'll need to pay close attention to portion control. Avoid eating from a large bag of almonds, and instead premeasure your 1-ounce portion before eating. Keep a few servings in the office fridge at work, or carry a small bag of almonds in your bag so you can snack during the day without blowing your diet. Use almonds as a substitute for complex carbohydrates to reap their weight-loss benefits. Use almond flour -- make by grinding almonds into a fine powder -- in muffins and other baked goods, and make almond "porridge" by cooking ground almonds in nonfat dairy milk, then topping the mixture with fresh berries for a wholesome and filling breakfast. What Is a Serving Size of Almonds? How Many Almonds Is 100 Calories?